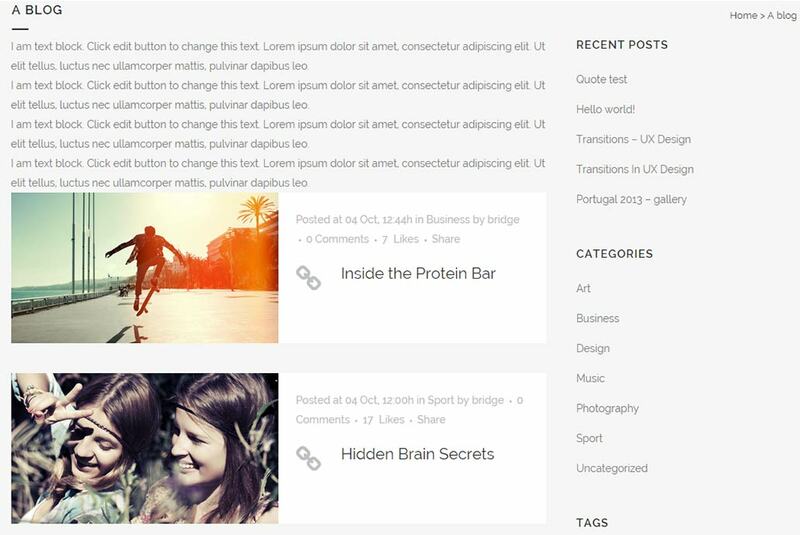 In order to create a category, go from your WP Admin to Posts -> Categories. Here, enter the desired category name, choose a parent for the category if needed, and optionally add a description. You can also enter a slug for the category, but don’t worry, if you don’t enter a slug it will be generated automatically. 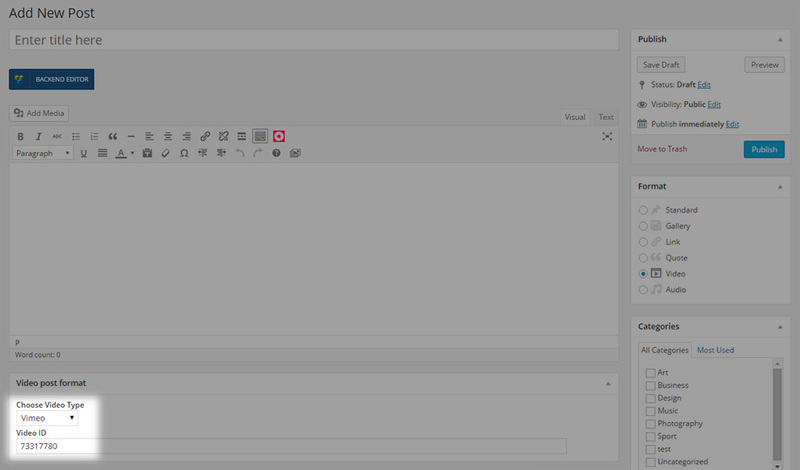 After creating categories, they will be available for you to assign posts to them in the post editor. 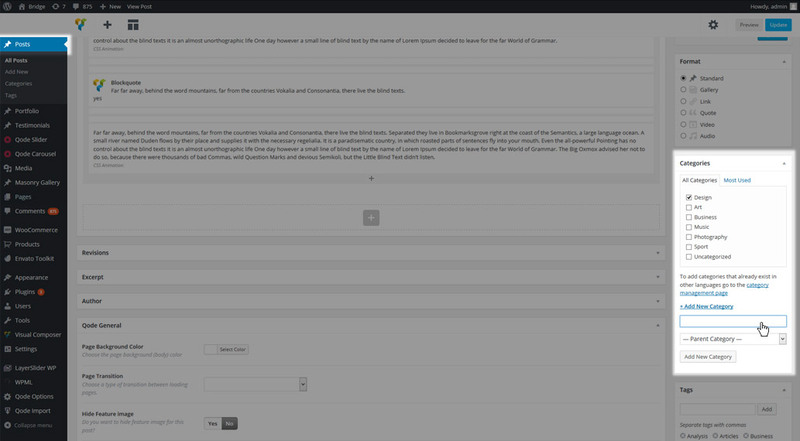 In a later section we will go through all the available global options for each blog list template. After you set up a page to display your blog list, you can start creating blog posts. 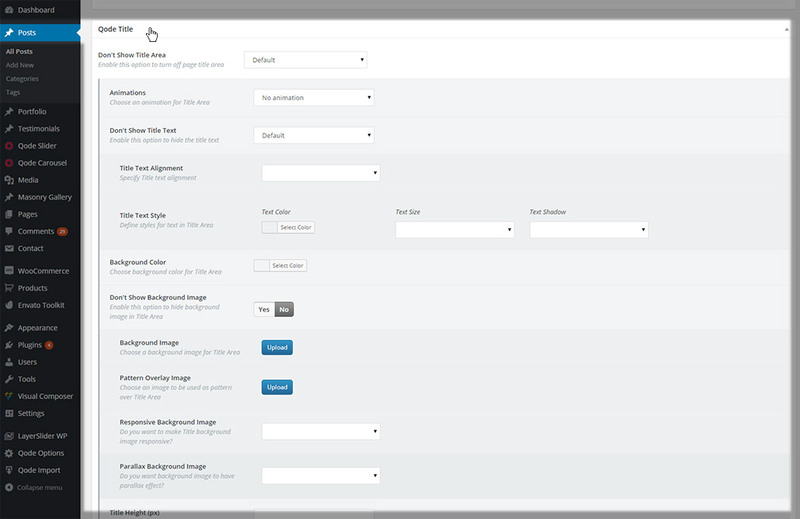 Then you can use the meta fields to configure your desired settings and layout. 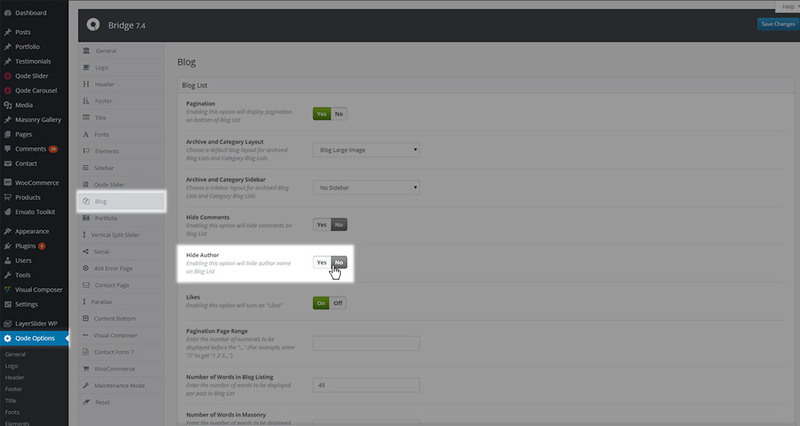 In the following sections we will go through all the available meta fields for blog posts. This setting can also be set in Qode Options -> General under Content Background Color. By setting it on a specific page or post you will override the color you set in the global options just for that specific page or post. Page Transition: If you have page transitions enabled in your global options, and would like a certain post to have a different loading effect from other pages or posts, or if you would like only a specific post to have a loading effect at all, you can set that here. Leaving this field empty means the page (or in this case post) will use the default setting from your global options. 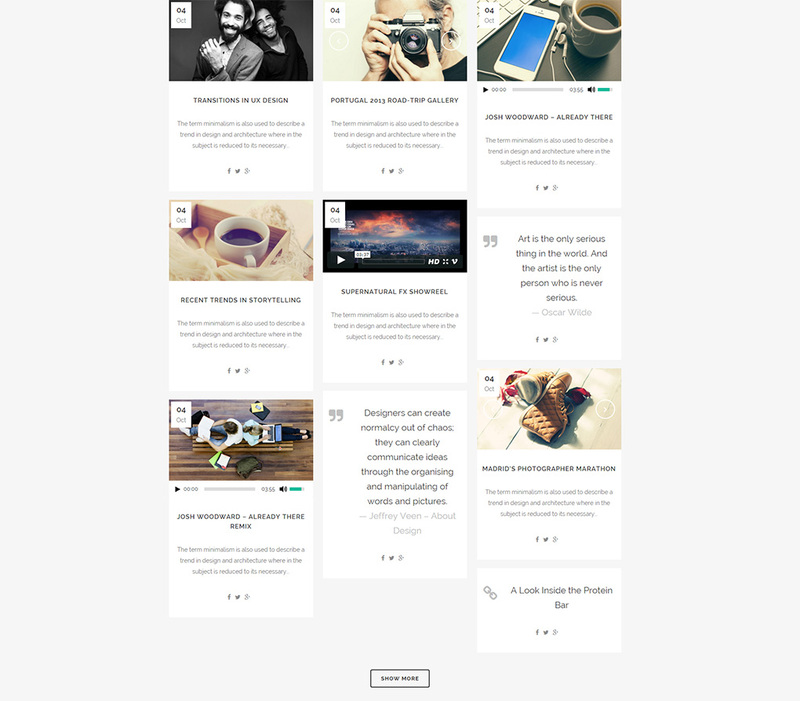 Layer Slider or Qode Slider Shortcode: As you can see from our page structure, every post can also contain a Slider that is placed below the header, but before the page content. The slider is implemented through this field. This is the only proper way for setting a Qode Slider onto your page, while the LayerSlider can be also placed in the page (or post) content using its shortcode. 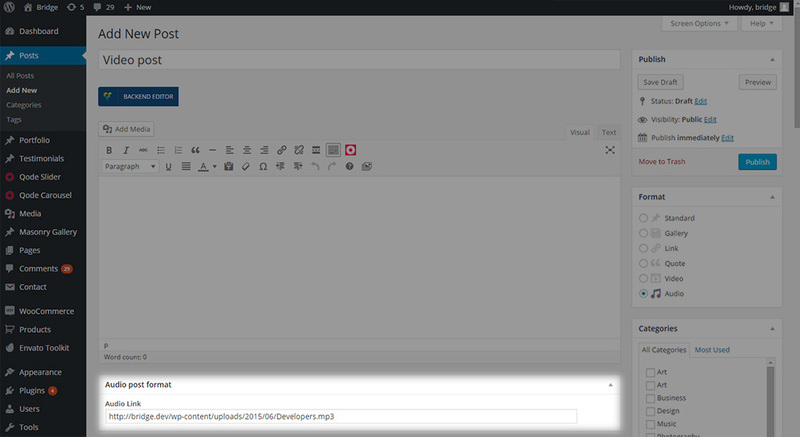 In order to display a slider between the header and content using this field, all you have to do is paste the desired slider’s shortcode into the field. 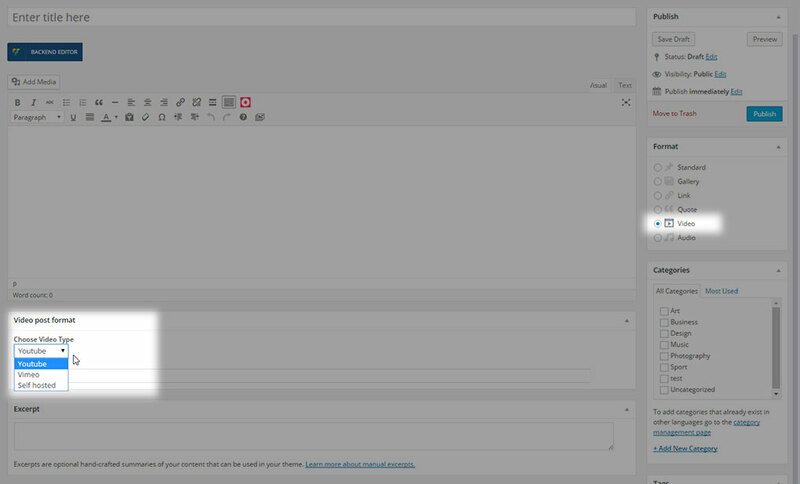 If you don’t like this effect you can disable it using this setting which will place all post elements (title – slider – content) below the header. Leaving this field empty, or setting it to No means the post will use the default setting, while setting this field to Yes will put all post elements below the header. 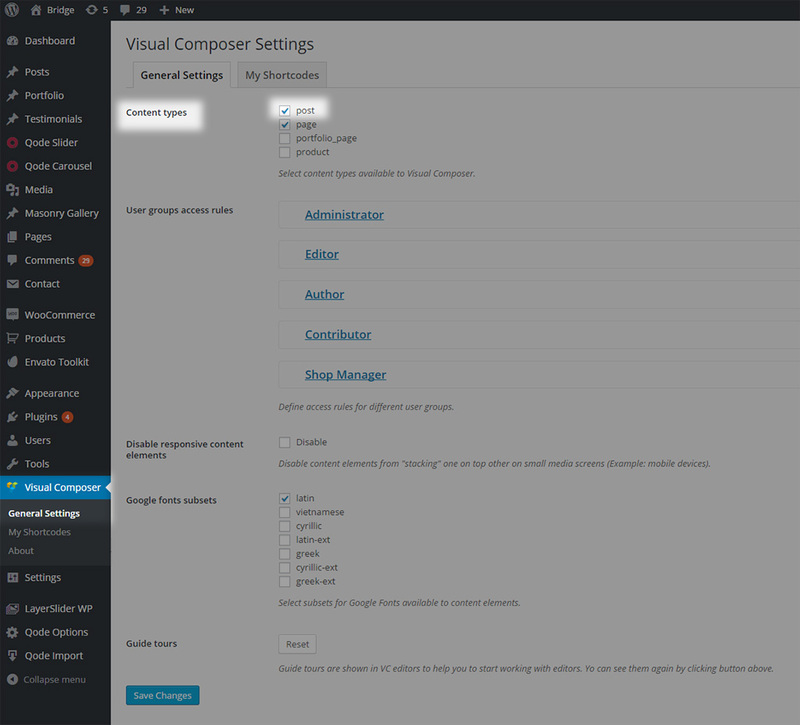 This setting is applied only if you are using the Visual Composer page builder for creating content. If you set this field to Yes, you can then define which header skin will be displayed for each row on the page by going to edit that row and setting the desired skin in the Header Style field in the row options. This will affect both header areas: header top and header bottom. Initial Header Transparency: Defines the header transparency for this specific post. This field also affects the header top and header bottom area, and can take values from 0 to 1. Hide Sticky Header Initially: This setting will initially hide the header before the page is scrolled, after which the header will appear (depending on the value set in the Scroll amount for sticky header appearance field. Empty field means post header is using default setting, while setting this field to Yes will hide header initially and No will disable that. In this section you can override the default settings made in Qode Options -> Title. Don’t Show Title Area: In this field you can define whether the title area will be visible on this post. No –If the title is enabled in your global options, setting this field to No will simply give you access to other options regarding the title which will override global options. If the title is disabled in your global options, then setting this field to No will display the title on this specific page (or post). Yes – Setting this field to Yes will make sure the title is not displayed on this page (or post). .
No animation – no animation will be set . Text right to left – text will appear from the right side of the screen and slide in to the left side of the title area. Title area top to bottom – the entire title area will appear from the top of the screen. Yes – The title text will not be displayed. 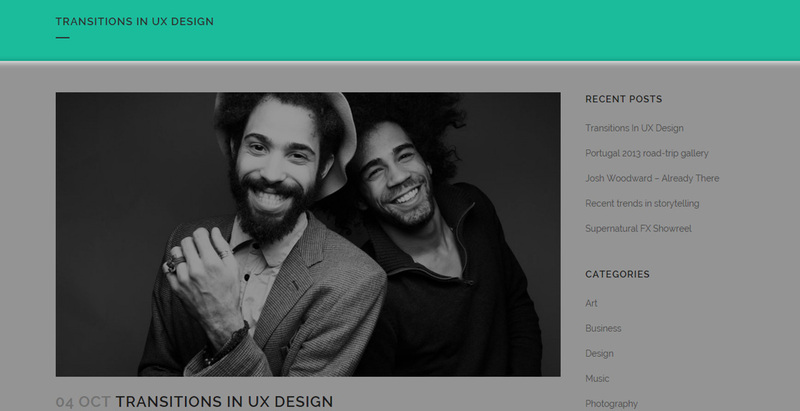 Background image – Choose a background image to be displayed in title area for this page. 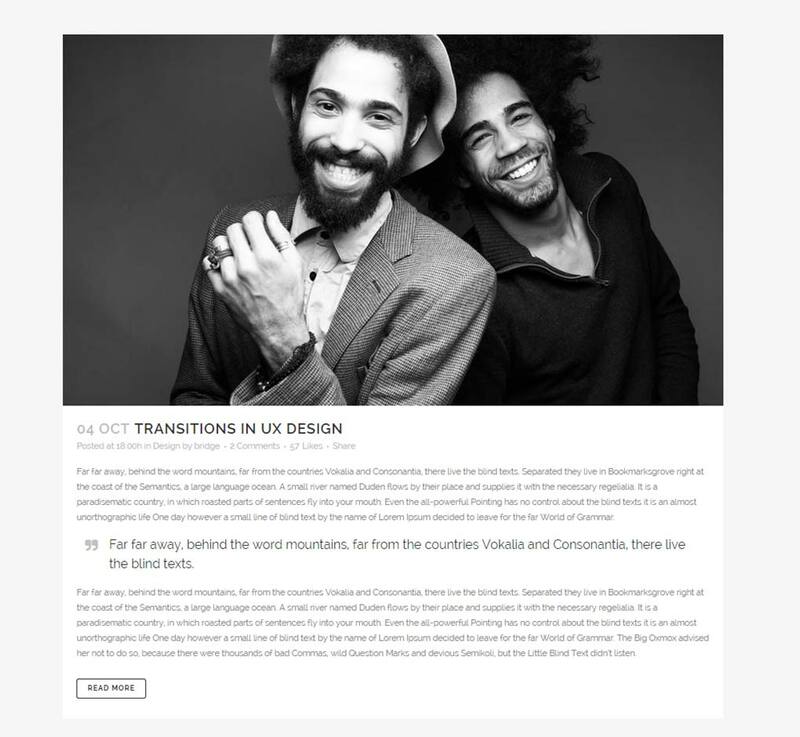 Parallax Background Image – Choose if you want to have a parallax effect on your title image. You can choose between four values: default (empty value), No, Yes, and Yes, with zoom out. Title Height (px) – Define the height of the title area. the value should be entered without the unit at the end (only value, for example 500. Not 500px). This value will override the title height setting from Qode Options -> Title. Separator Under Title Text – Here you can choose whether you would like to have a separator displayed under the title text. You can chose one of three values: default (empty value), No to hide the separator, or Yes to display it. Separator color – Set a desired color for the separator if you have it enabled either in Qode Options -> Title, or on a specific post. This color will override the one set in Qode Options -> Title. Yes – the angled title will be displayed and a panel with additional options for the angled title will be displayed. Subtitle text – here you can input subtitle text which will be displayed below the title text in the title area. Spacing After title - Additionally, regardless of whether you have set the title area to be visible or not, two more fields are available for defining the spacing after title. The first fields defines the margin after the title area (no need to input the unit, just the value: e.g. 50, not 50px) while the second field lets you choose if this same margin will be applied for the mobile header also. Whole Title Content - The defined animation will be applied to the entire title area. No – Animation won’t be set for this part of the title area. If some other value is set in Qode Options -> Title, this setting will override it and disable the animation. 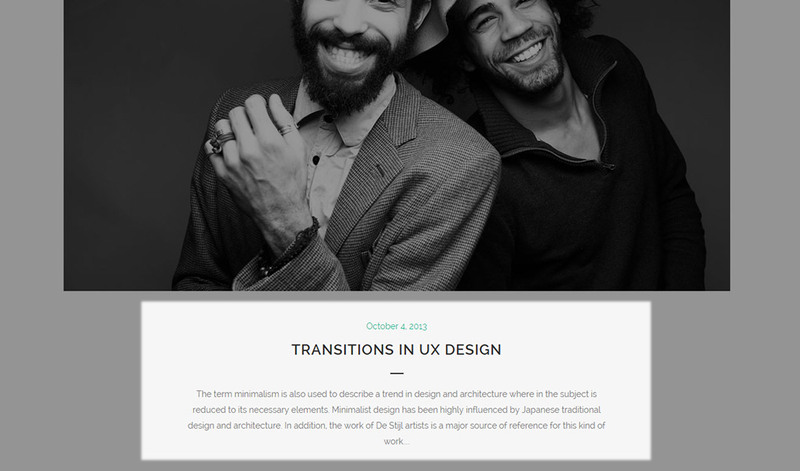 This feature is created for advanced users that have experience with CSS animations. If you would like to set some content to appear between the post content area and the footer, then you can use Qode Content Bottom area. 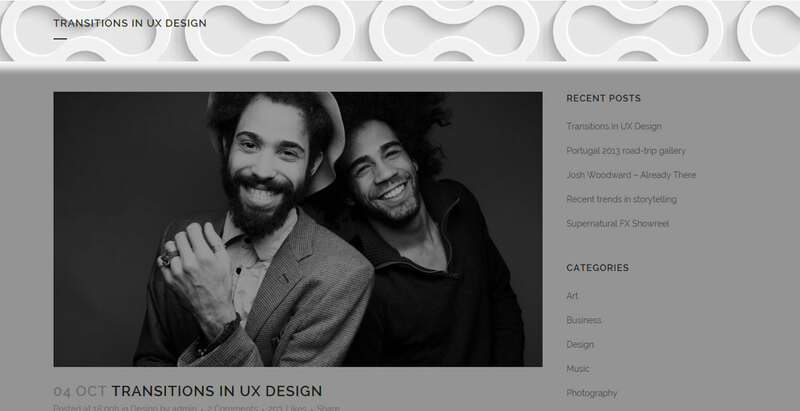 This area grants extra space in the form of a widget area, and the content of this area is created through widgets. 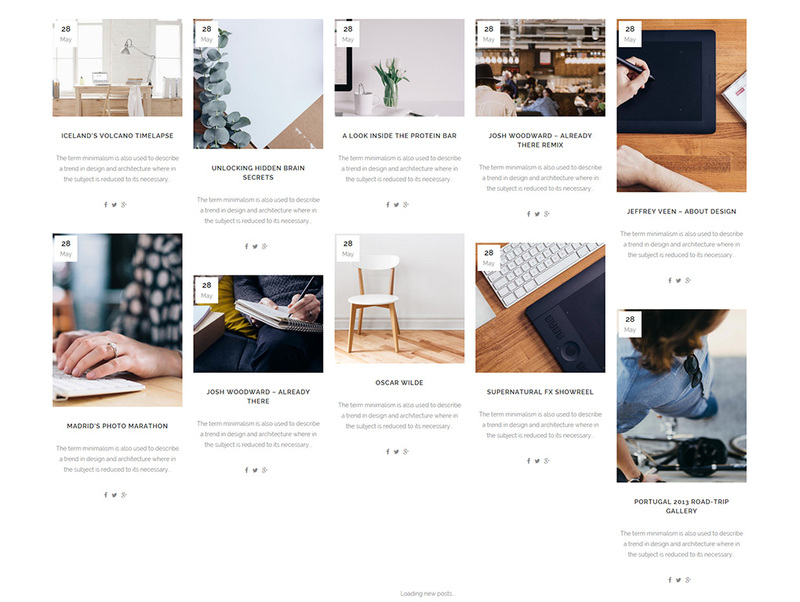 You can either define the content bottom area in the global theme options, making it visible on all pages on your website, or you can set it on a page to page basis. 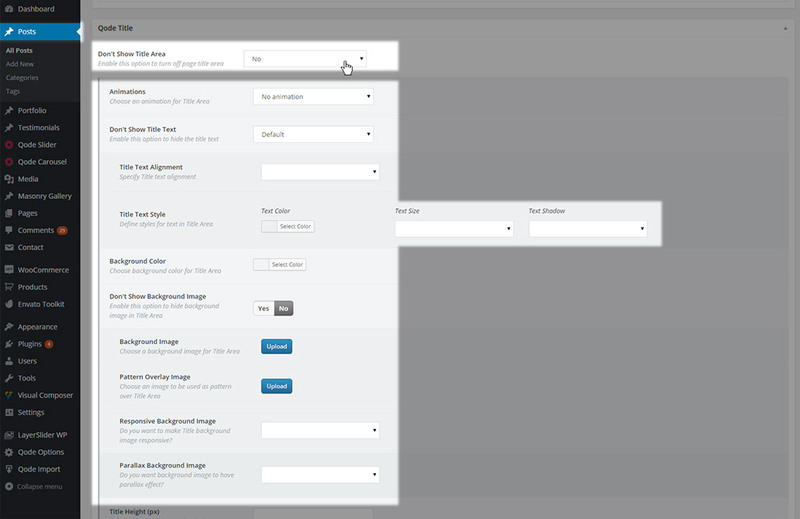 Custom widget – Choose a widget area to be displayed in the content bottom area. This dropdown area is populated with all the custom widget areas created. Here you can set up an excerpt for your post (an optional summary or description of a post). 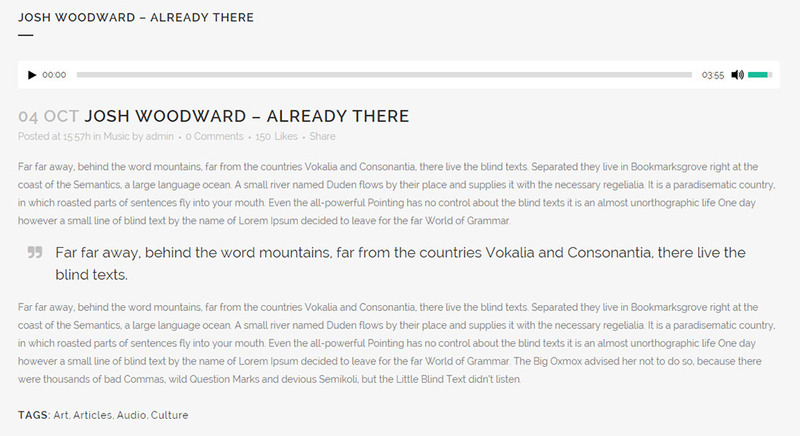 The post excerpt is the short text that will be displayed on your blog list page. 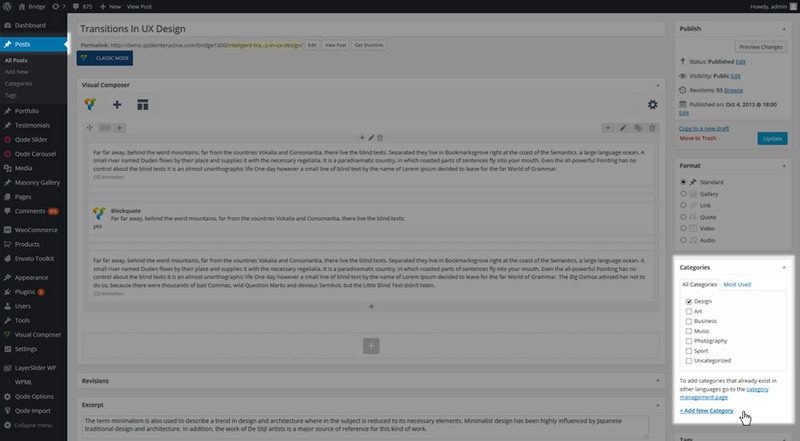 If you don’t see the post excerpt field, please check the Screen Options in the upper right corner of your screen. 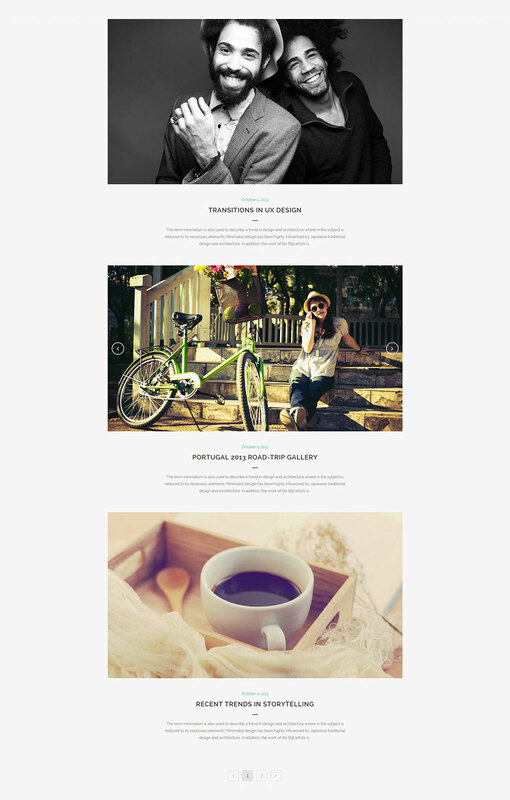 Gallery – this format features an image gallery slider. In order for it to work, you need to add a gallery at the top of your page. 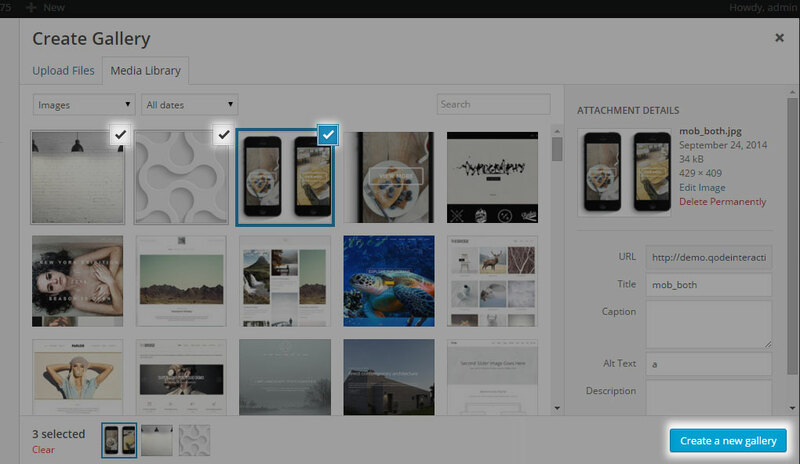 Select the images that you wish to add, and click the “Create a new gallery” button. It is recommended that you upload images that are the same size. Please note that if you enter a caption for your image, it will not be displayed. The caption will only be visible if you add that image as content within the post itself. 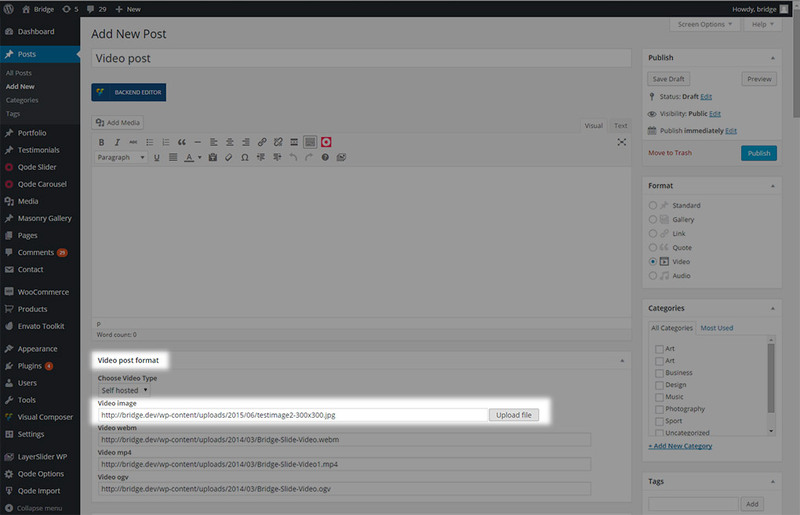 If you prefer using the WordPress default editor, then you can add a gallery by navigating to Posts -> Add New Post where you should click on the Add Media button and repeat steps from c) – e). 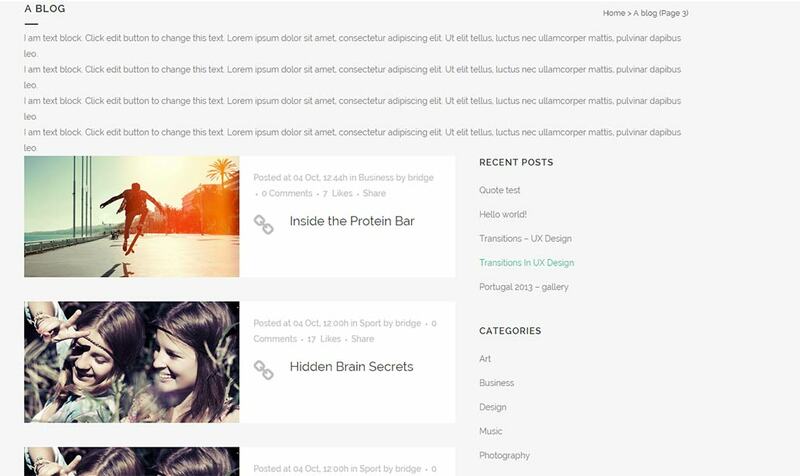 Then you can add content to the post as you would regularly do for any page, post, portfolio etc. Link – The link post format can be used to display links to other web pages. If you choose this post format one more additional field called Link will appear. Here you can enter the full URL or the page you wish to link to. This link will be accessible only when you open the post. Otherwise – on your Blog List page you will not be able to open the link directly, only the post itself. Also note that this post type doesn’t have an excerpt (it doesn’t matter if you add content to the excerpt field in the backend of the post). 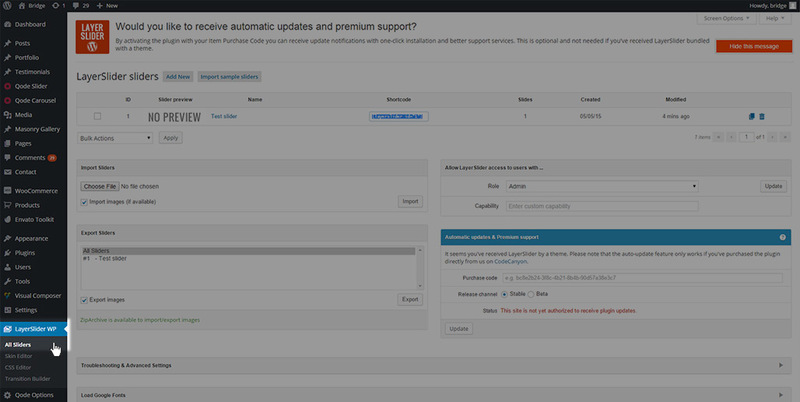 If any content is added in the content area, it will be displayed below the quote. Underneath the quote text, the title of the quote post will be displayed. 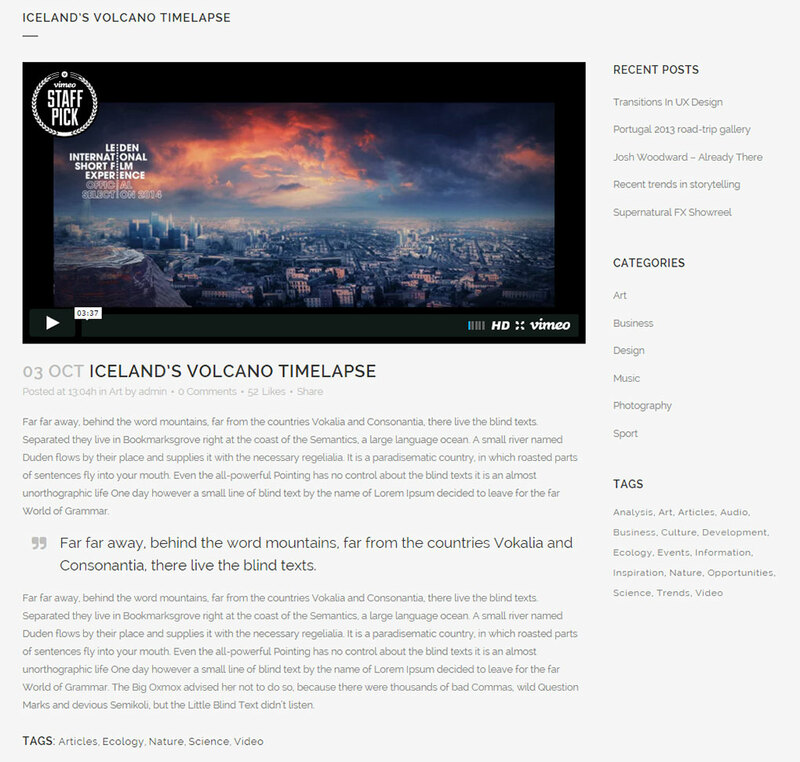 Video – The video post format can be used to display YouTube, Vimeo, and self-hosted videos. It is recommended to upload videos in all three formats (webm, mp4, ogv) to make sure your video will be displayed in all modern browsers. Audio – The audio post format can be used to display audio files. In this section we will explain how to create categories for your blog posts and how to add your posts to specific categories. All posts can be assigned to a category. 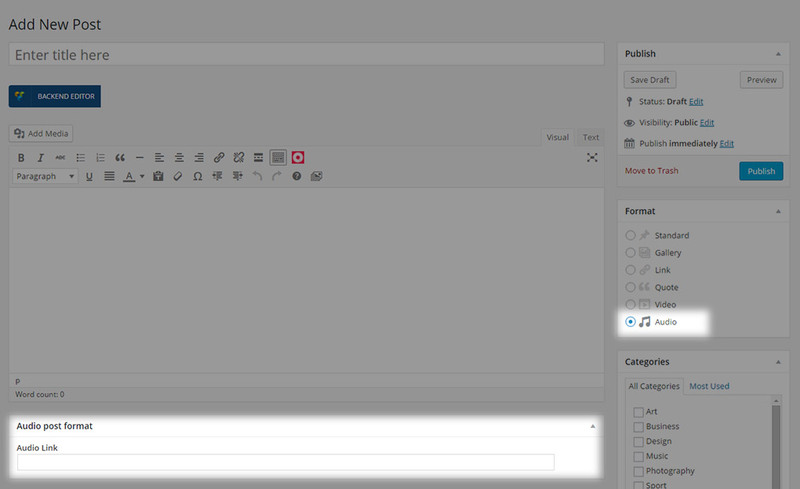 To create a category directly from the post editor, click on +Add new category. Add a category name, select a parent category if needed, and click Add New Category. 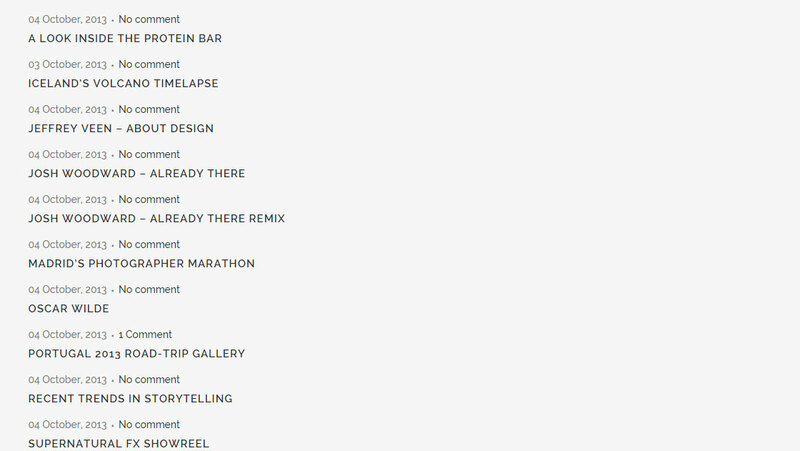 The new category will be displayed on the list, and selected as the category for the post you are editing. In this section we will describe all the available global blog options in detail. In the Blog List panel of the global blog options you will find general settings for your blog list, as well as individual sets of settings for each of the available blog list templates in our theme. Pagination – Enable or disable the pagination on your blog lists. Setting this option to Yes will display pagination, while No will disable it. Archive and Category layout – This setting defines the layout of blog archive and category pages, as well as the home page if it is set to display latest post. .
or No - to display comments. (these screenshots are for the Blog Large Image template, the author information on other blog templates might have a slightly different look). 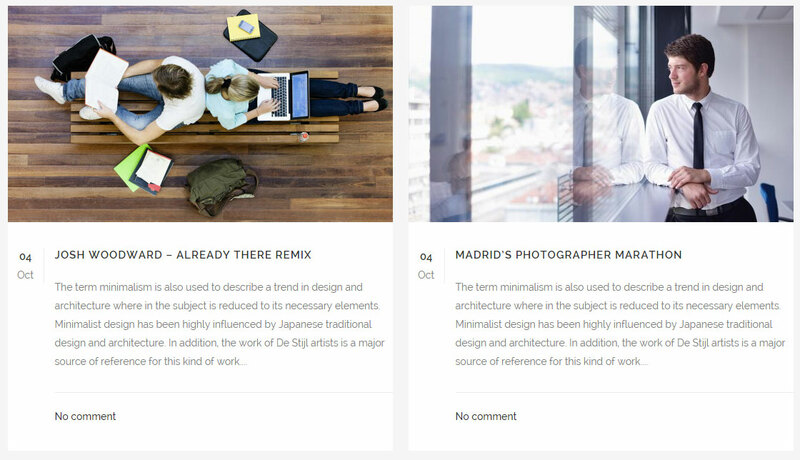 Likes – Here you can choose whether likes will be displayed on your blog lists. or Off - to hide them. Pagination Page Range – Here you can define the number of pages that should be displayed in the pagination. After your selected number of pages, three dots will appear (…), and the last available page will be displayed after the dots. Number of Words in Masonry – Here you can define how many words you would like displayed in the post excerpt on blog lists set to the Blog Masonry template and in posts displayed using the Blog Masonry shortcode. Number of Words in Large Image – Here you can define how many words you would like displayed in the post excerpt on blog lists set to the Blog Large Image template. Number of Words in Small Image - Here you can define how many words you would like displayed in the post excerpt on blog lists using the Blog Small Image template. 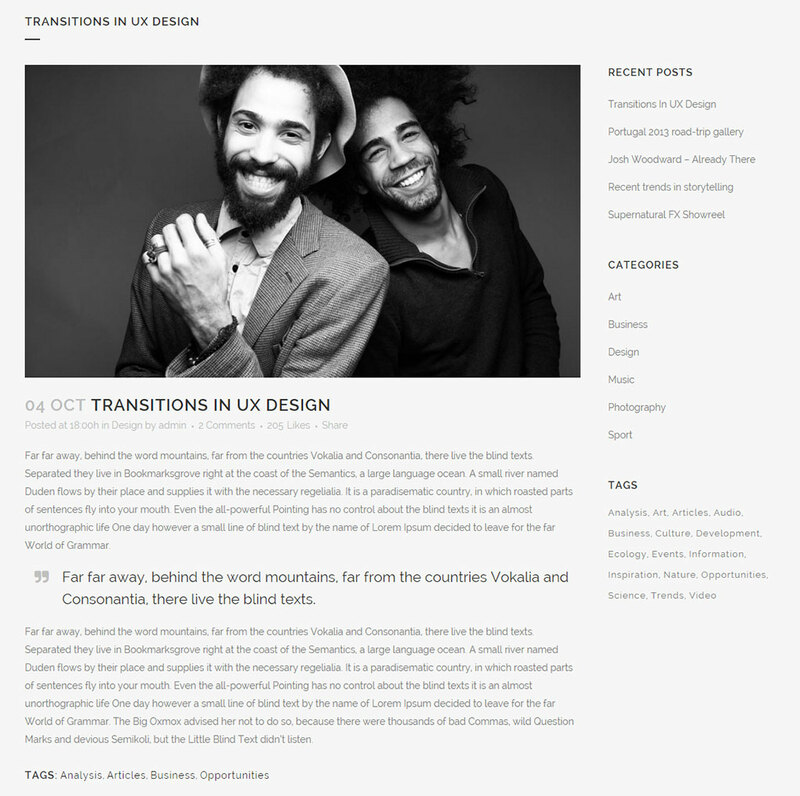 Content Position – This setting is created for blog page templates that have a sidebar enabled. Content Above Blog List – The page content will be placed above the blog list, and the sidebar will be aligned with the top of the content. 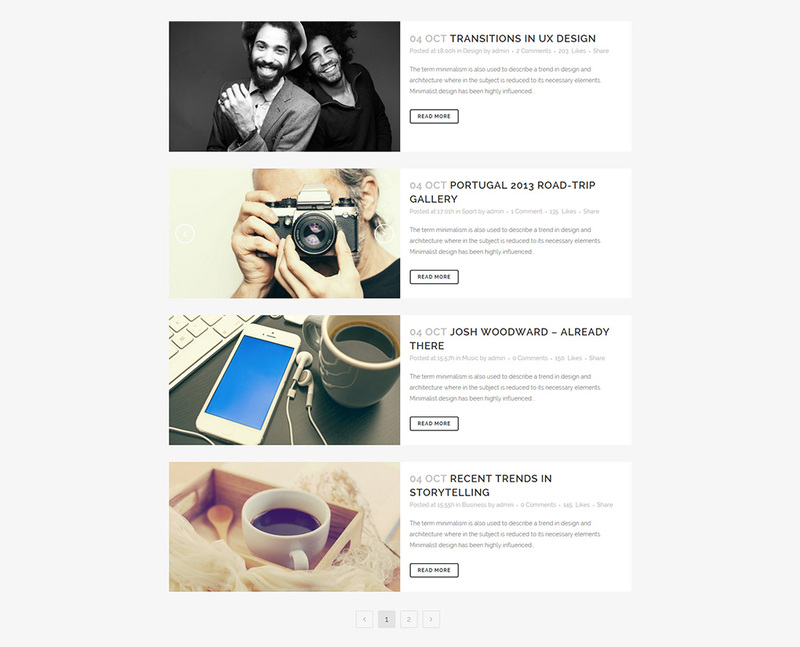 Content Above Blog List and Sidebar – The content will be placed above the blog list and the sidebar, while the sidebar will be aligned with the blog list. 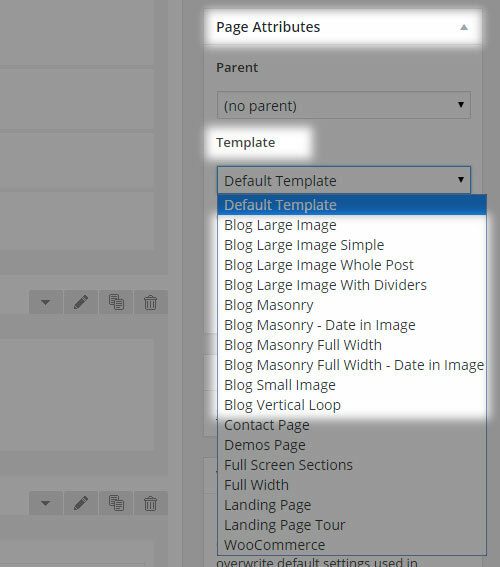 Pagination on Masonry – In this field you can define the pagination type that will be used on pages set to the Blog Masonry template. Show Category Filter on Masonry – This option defines where the filter for displaying posts from specific category should be displayed or not. or No - to hide it. You can enter the value in percentages (for example 10%) or in pixels (for example 100px). This value will apply to both left and right margins. Post Info Quote/Link Style – Here you can define styles for the post info text in posts set to the quote or link post formats. Post Info Quote/Link Style - Here you can define styles for the post info text in posts set to the quote or link post formats. 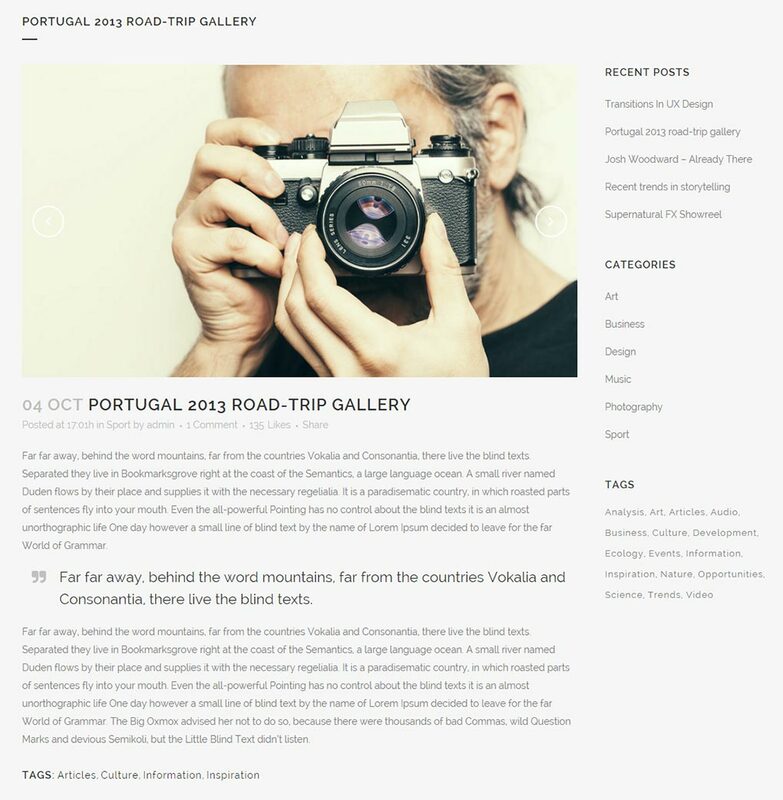 Box Content Style – Here you can define styles for the style for the post info box content in the Large Image Simple blog list. 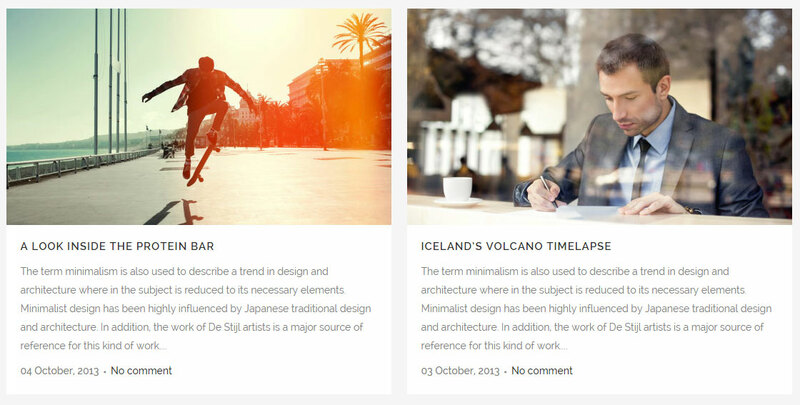 Date Style – Here you can define styles for the date displayed on posts in the Large Image Simple blog list. Quote/Link Date Style – Here you can define styles for the date in posts set to the quote or link post formats. 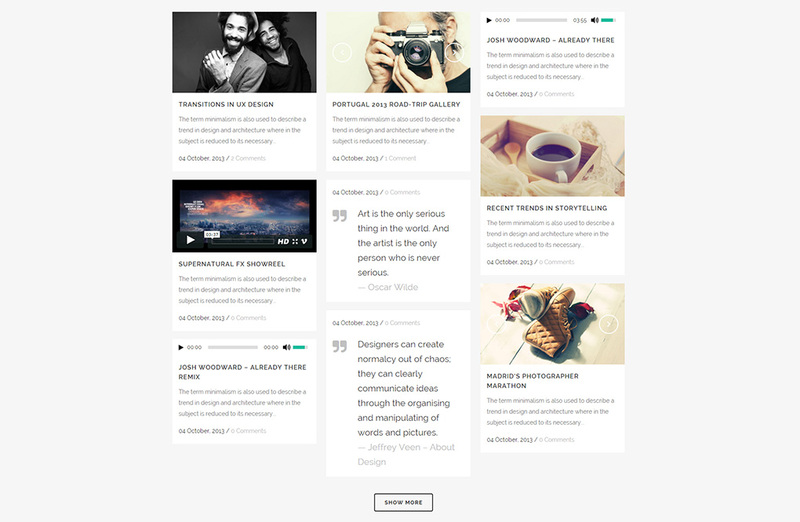 Title Style - Define the look of post titles in the Vertical Loop blog list. Next Post Title Style - Define styles for the title of the next post. 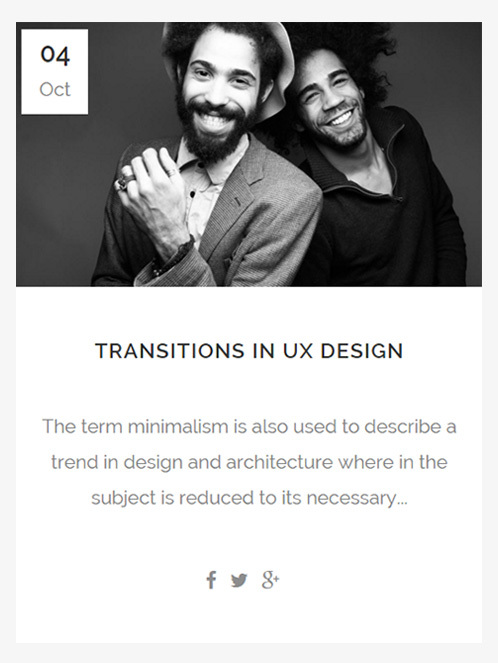 Post Info Style - Define styles for the post info text. Quote/Link Title Style - Define the style for the post titles on posts set to the quote or link post formats. Quote/Link Post Info – Define the style for the post info text on posts set to the quote or link post formats. 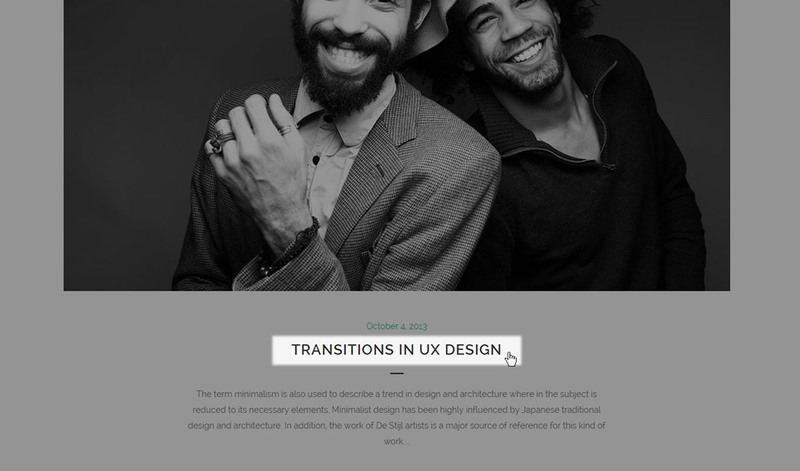 Next/Prev Button Style – Define the style for the next/previous post buttons. Masonry - Date in Image Style – Here you can set a background color for the text box. 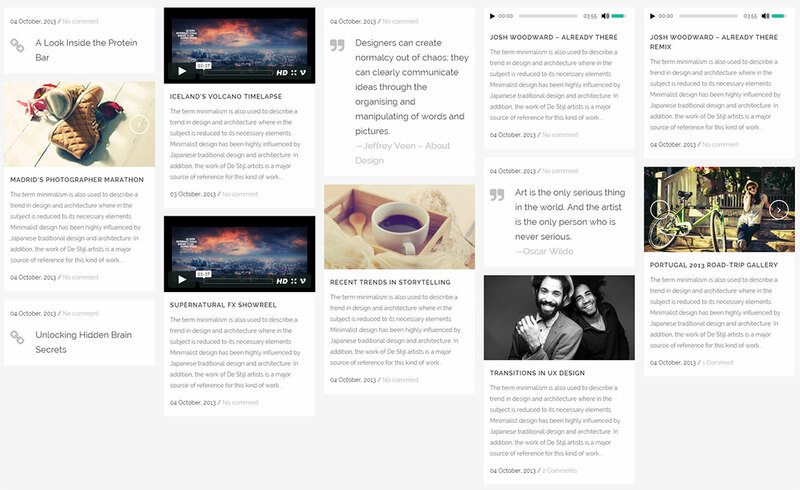 Title Style - Define the look of post titles in the Masonry – Date in Image blog list. 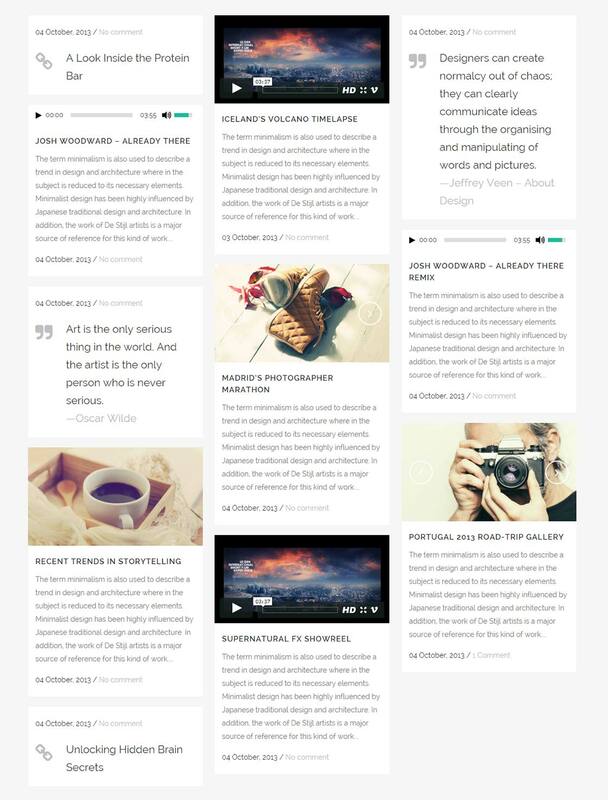 Sidebar Layout - Choose a sidebar layout for your blog single posts. Sidebar to Display - Choose a custom widget area to display in your sidebar. 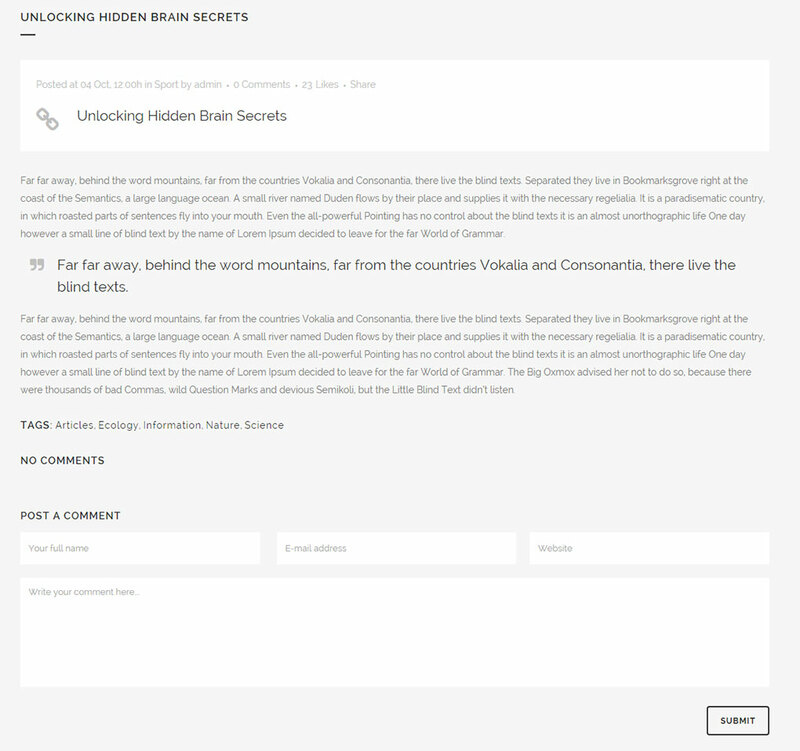 Show Blog Author – Set this option to "Yes" if you want your blog single posts to contain an "About the author" section which is displayed between the post content and the comment section (if the comment section is enabled). 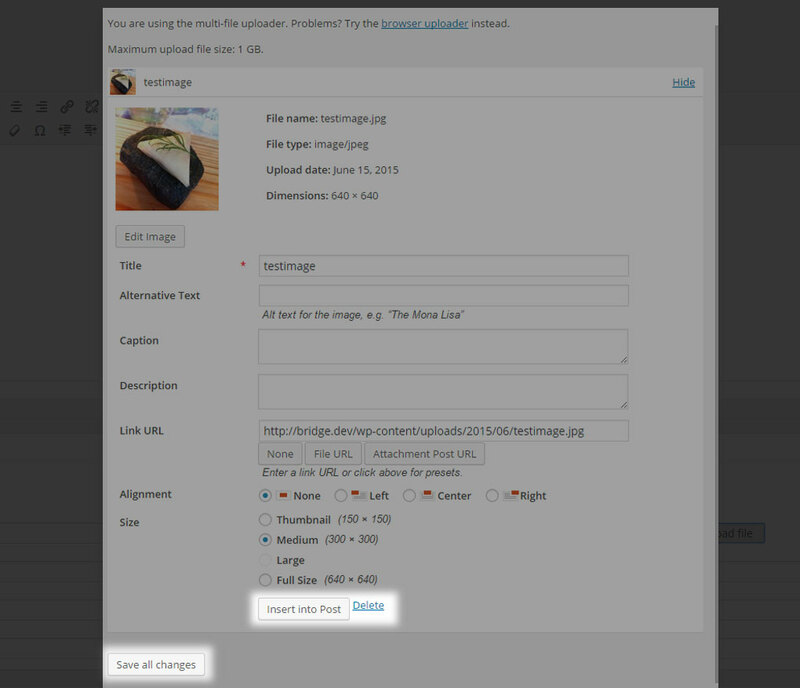 Blog Single Spacing - Set margins for the image, title, and post info on blog single posts. 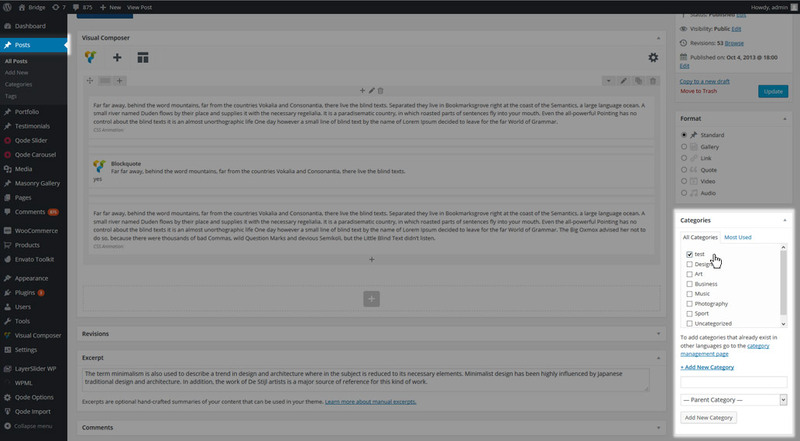 Box Background Color - This option applies only to blog posts that are set to either the Quote or the Link post format. 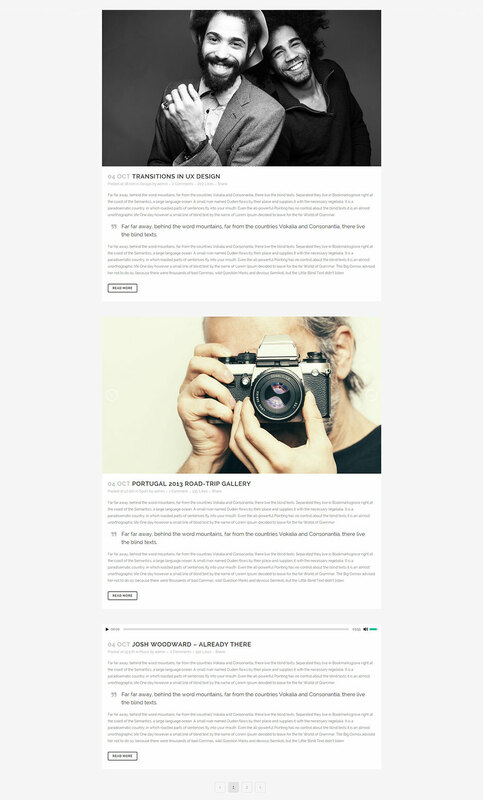 The box color you set here will be visible on both Blog Lists and Blog Single pages. This option doesn’t depend on the blog template that you are using. 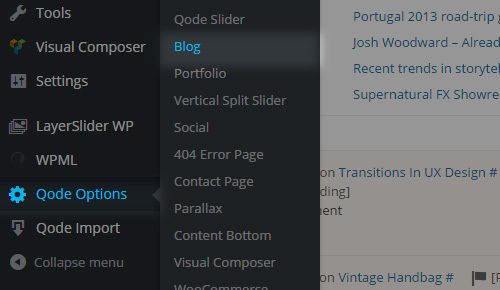 In the Blog Slider panel of the global blog options you will find general settings for the blog slider shortcode. 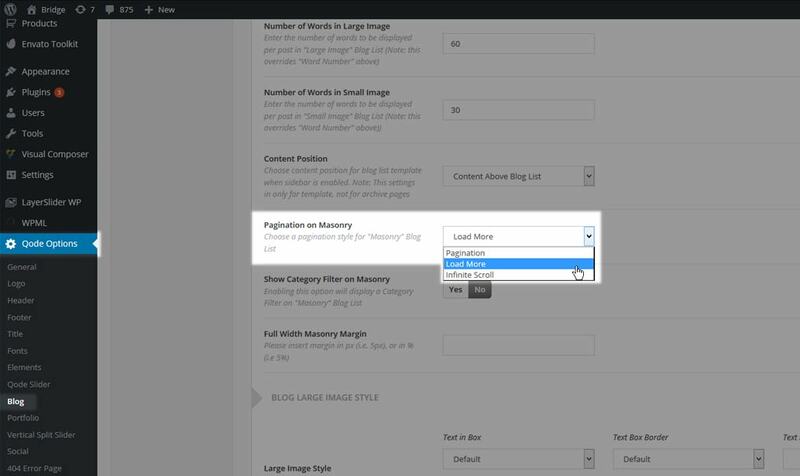 When setting the blog slider shortcode onto a page on your site you can choose between two types of blog sliders. 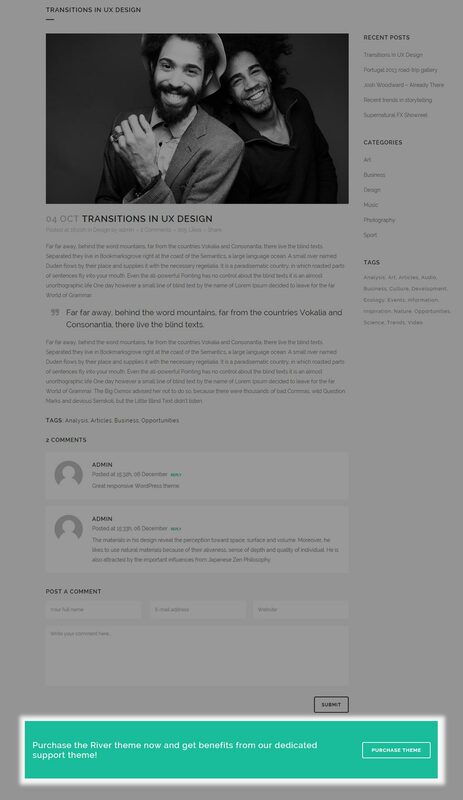 There are separate sets of options in the Blog Slider panel of the global blog options for both slider types. Please note that default type of Blog Slider is Carousel. Title Style - Set styles for the slider title. Post Info Style - Set styles for the post info text. Day Style - Set styles for the day (in the post info), when post info position is set to bottom. (Otherwise the style will be inherited from the Post Info Style options above). 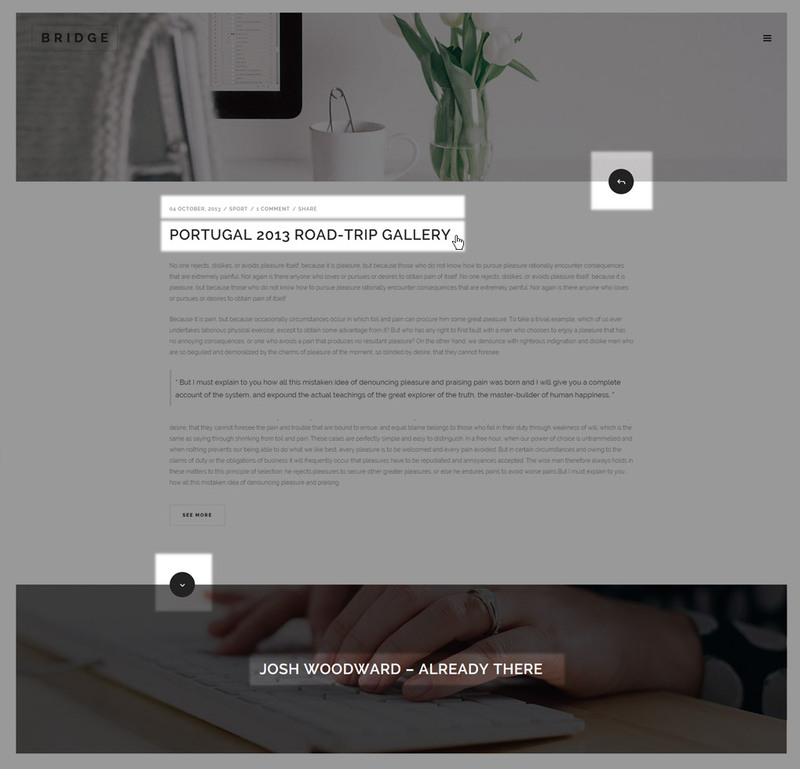 Blog Slider Spacing - Define margins for the slider content. 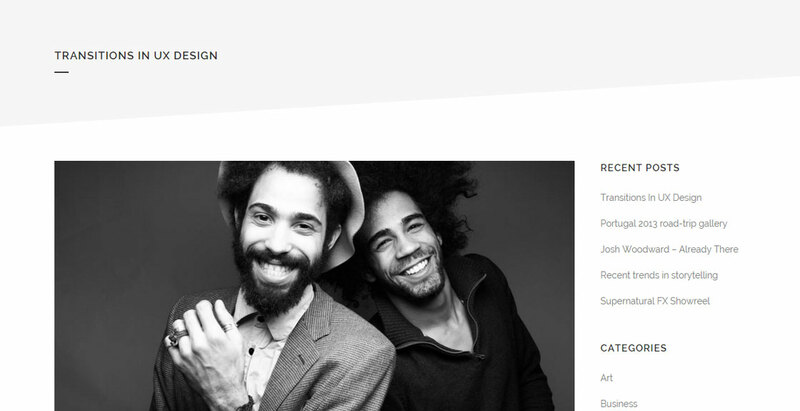 Box Style - Define styles for the post info box. 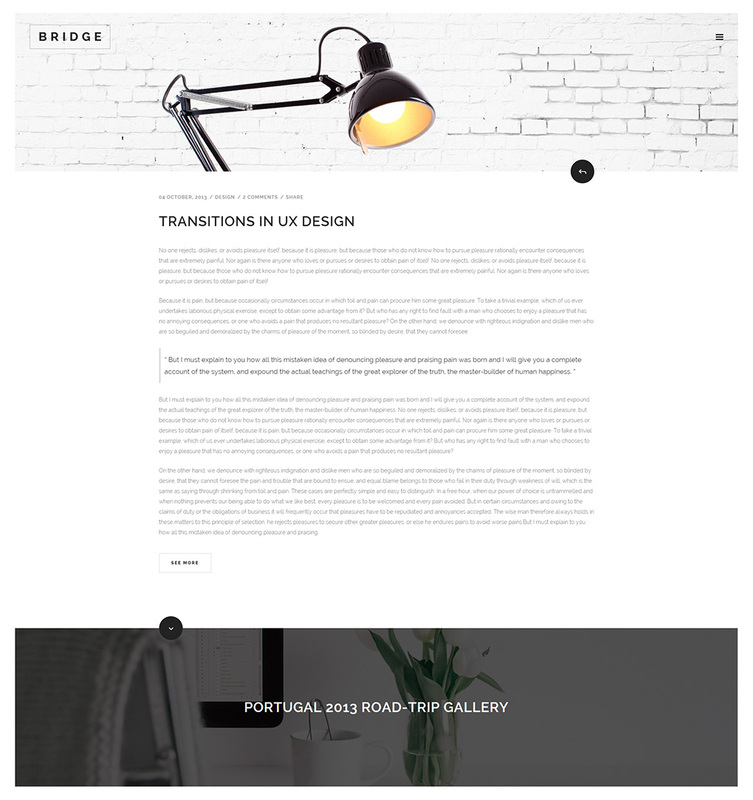 In this section we will describe the shortcodes provided in Bridge for displaying blog posts, and go through all the available options for each one. All types except Minimal will show the featured images of displayed posts. Therefore, it is recommended that you set featured image for all posts (and for all post types – including quote/link, gallery etc.). If the featured image is bigger than 539x303 pixels then it will be cropped to those dimensions. This only means that the maximum size for featured image is 539x303px, it doesn’t mean that the featured image will be displayed in those dimensions. 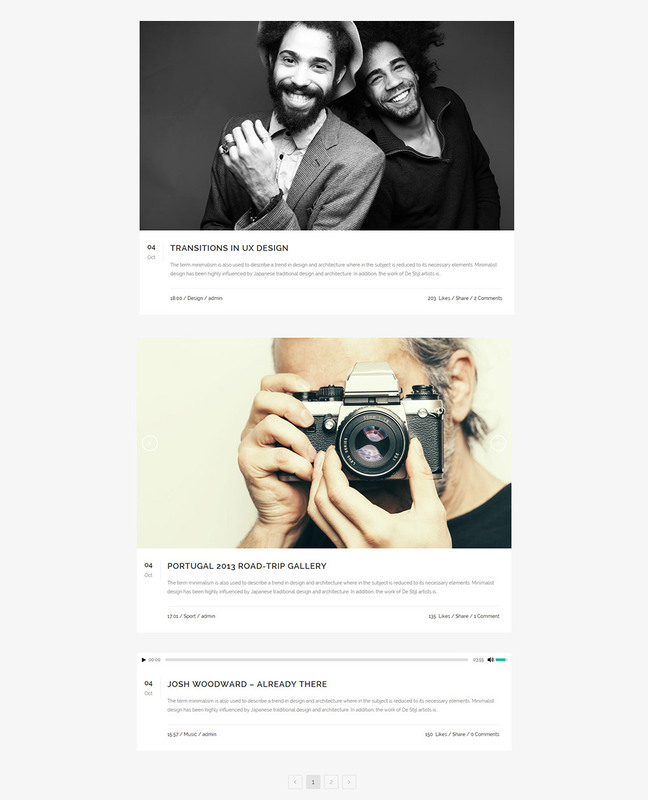 The actual display size of featured images depends on the screen size, page layout (full width, in grid, with sidebar) and the type of Latest Post layout that you have chosen. Number of Posts - Enter the number of posts you would like to display. Order By – Choose how you would like to order the posts. Blog posts can be organized by title or date. Order - Choose between ascending or descending order. Category Slug - If you would like to show blog posts from certain categories, enter the category slugs here, separated by commas. Alternatively, to display all categories, leave this field empty. Text length - Enter the number of characters, spaces included, that you would like to display per post excerpt. Title Tag - You can choose a heading style to apply to the post titles. 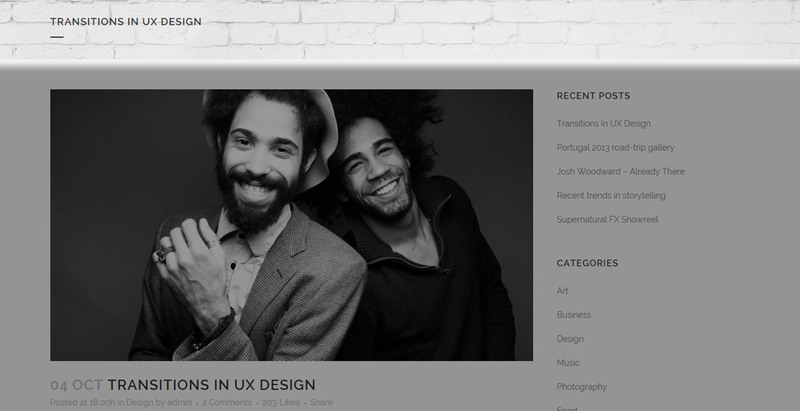 Display category - Choose whether to display the category tag. Display date - Choose whether to display the date. The date will be displayed in format d M, Y (e.g. 01 June, 2015). Display comments - Choose whether to display the number of comments the post has. Display like - Choose whether to turn on "likes." Display share - Choose whether to enable social sharing. Please note that you also have to enable this option in Qode Options -> Social. Number of Columns - You can choose the number of columns (up to 4) you would like your posts to be displayed in. Number of Rows - Choose the number of rows (up to 5) you would like your posts displayed in. 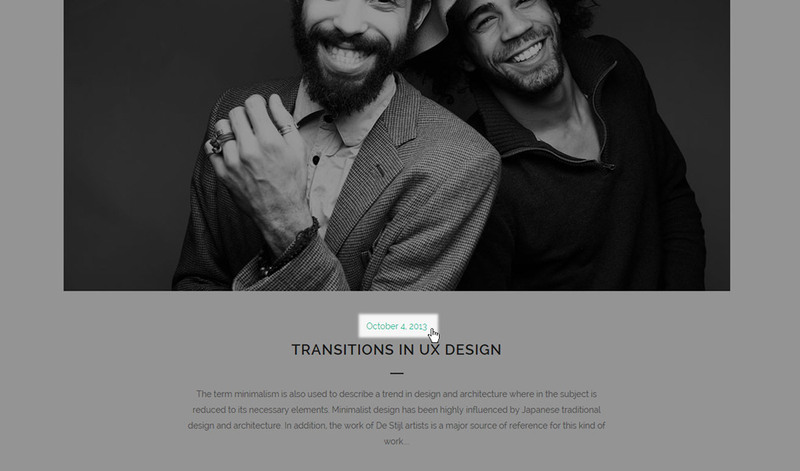 Text from edge – Text can stretch across the full width of the box, or it can have padding on the sides. Order By - Choose how you would like to order the posts. Blog posts can be organized by title or date. Note: Please note that there is no Number of Posts option for these two types of Blog List. However, you can control the number of displayed posts using the Number of Rows and Number of Columns options, which basically mean that you can display a maximum of 20 posts with these two types. Display date - Choose whether to display the date. The date format different for this type of Latest Post: d M (e.g. 01 June). Note: Please note that there is no Number of Posts option for this type of Blog List. However, you can control the number of displayed posts using the Number of Rows and Number of Columns options, which basically mean that you can display a maximum of 20 posts with this type. With the Image in Left Box and Minimal types of Latest Post, only the post title is a link that leads to the post itself. With the other two types - Boxes and Boxes with Dividers, the post featured image and title are both links that lead to the post. 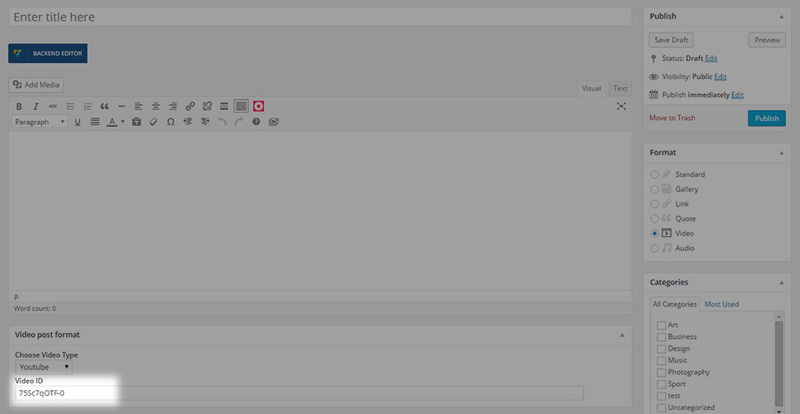 Note: The Latest Posts shortcode does not have a built-in option to display a Read More button. 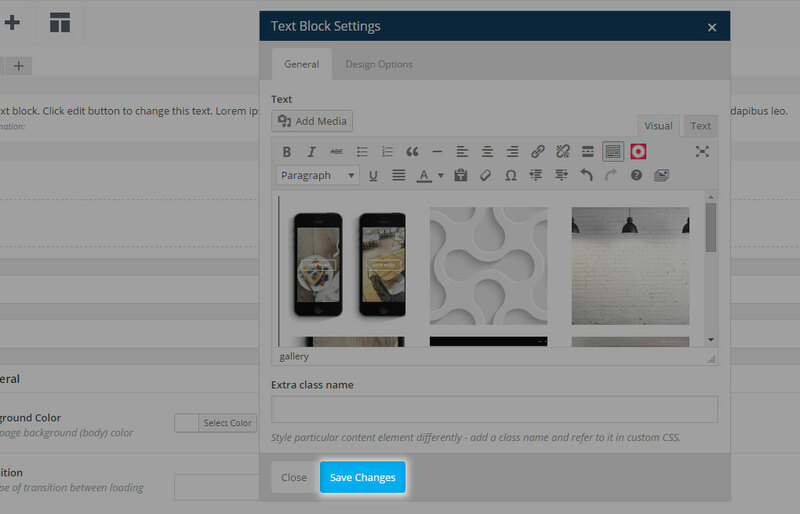 This shortcode allows you to display your blog posts in masonry style. With this shortcode posts are listed the same way they are when using the Blog Masonry template. This means that for non-standard post types, instead of the featured image, a video (for the video post type), gallery (for the gallery post type), etc. will be displayed. If this shortcode is used with the Default page template, then the maximum number of columns is 3, while maximum number of columns when using the Full Width page template is 5. Display date - Choose whether to display the date. The date will be displayed in the format d M, Y (e.g 01 June, 2015). 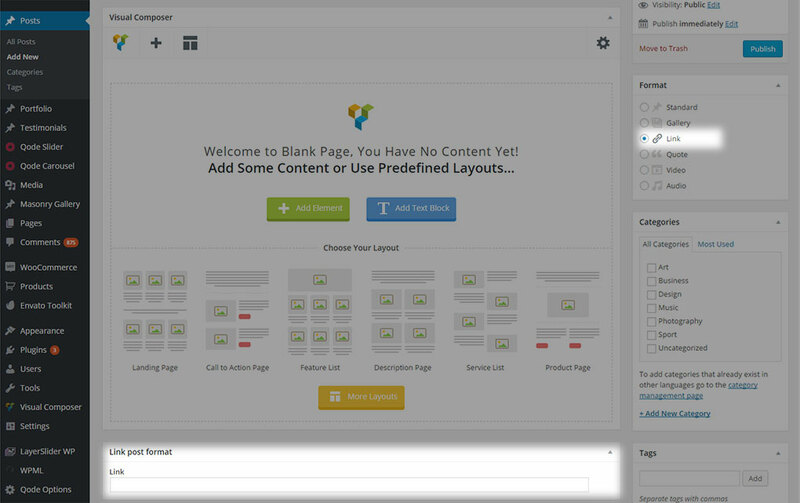 The Blog Slider shortcode lets you display your blog posts within a slider on any page. 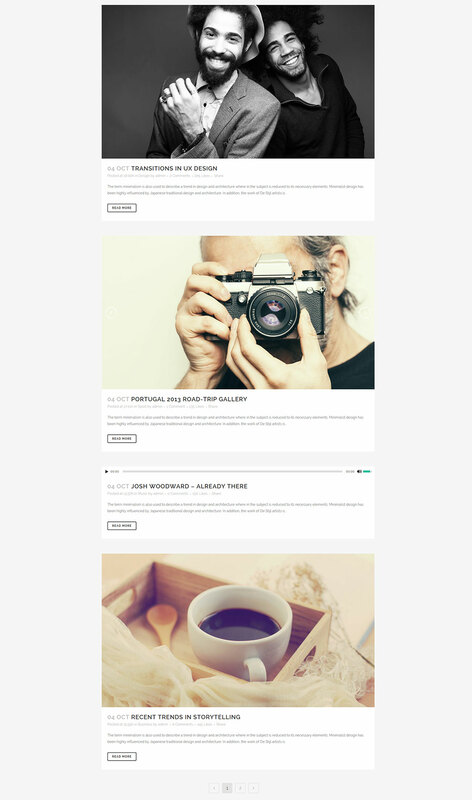 When using the Blog Slider, it is recommended that you upload all your posts’ featured images in the same size in order to achieve the best looking layout. Global styling options for the Blog Slider shortcode can be found in Qode Options -> Blog -> Blog Slider. 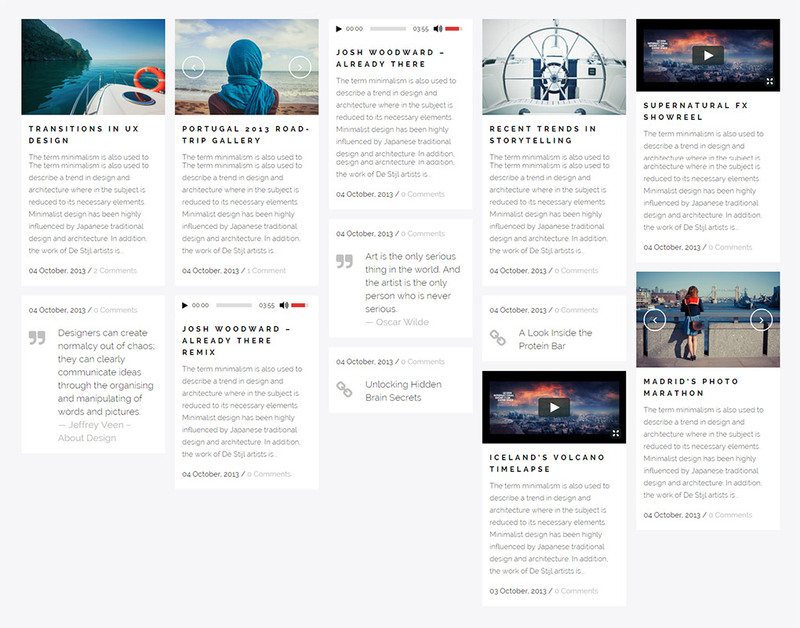 Slider Type- Choose the type of Blog Slider you would like to use. When using the Carousel type, multiple posts can be visible at the same time, while with the Simple Blog Slider type only one post is visible at a time (it will be stretched to the holder width). With both types it is possible to manually scroll between posts. Post Info Position- Choose a position for the post info. 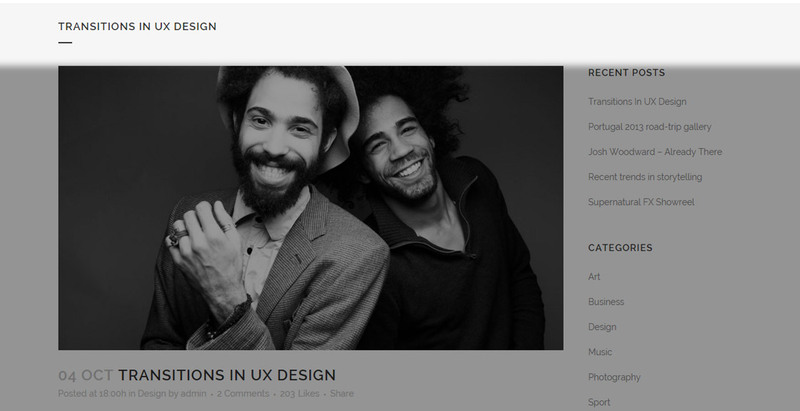 It can be either visible on hover (Default) or always visible at the bottom of the featured image (Bottom). Image Width- Set a width for the image. Image Height- Set a height for the image. Order By– Select how to order your blog posts. Blog posts can be ordered by Menu Order, Title, or Date. Order– Choose between ascending and descending order. 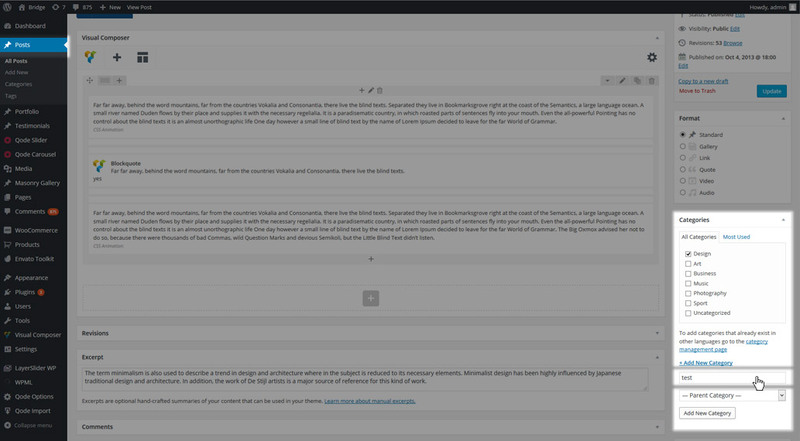 Number– Set the number of blog posts to display in the blog slider. 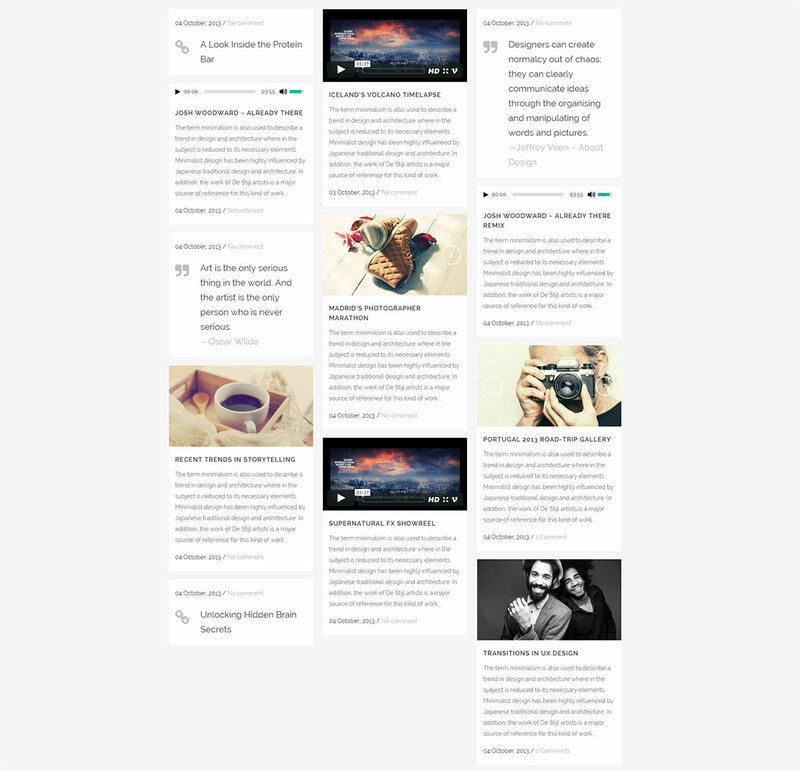 Number of Blog Posts Shown– Choose the number of posts that will display at once across the full width of the screen (less will be shown on smaller screens, due to responsiveness). This option is only available for the Carousel type of Blog Slider. Category– If you would like to show blog posts from certain categories, enter the category slugs here, separated by commas. Alternatively, to display all categories, leave this field empty. 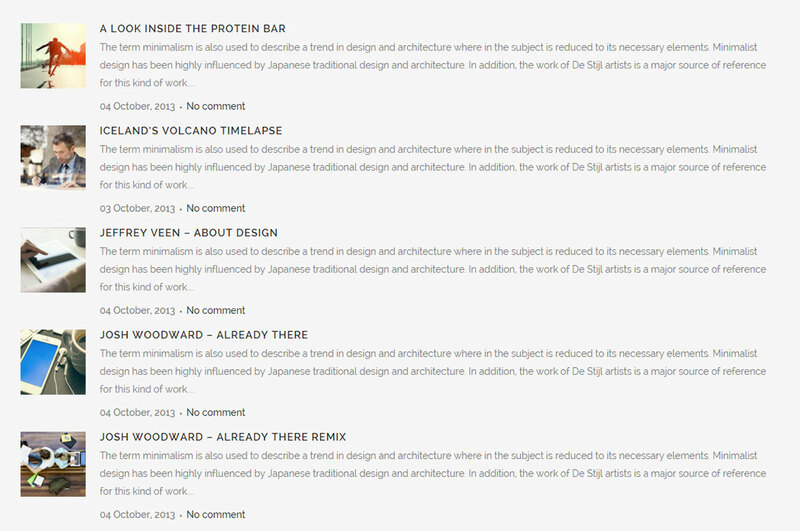 Selected Projects– If you would like to display only certain posts in the blog slider, enter the IDs of those posts here. 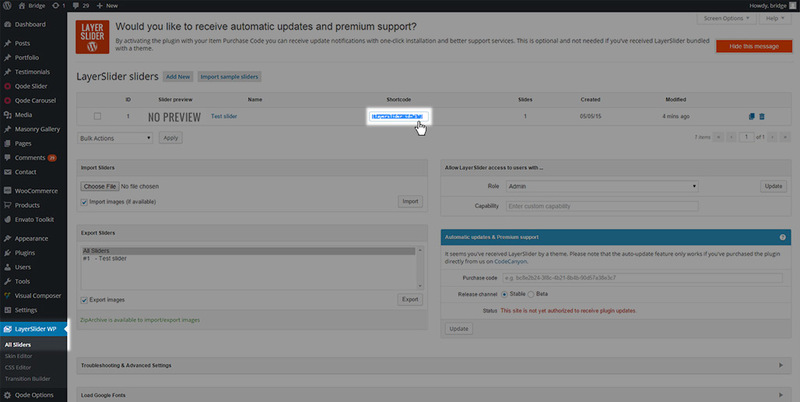 Info Box Color – Set a background color for the info box that holds the post title, publishing date, author etc. 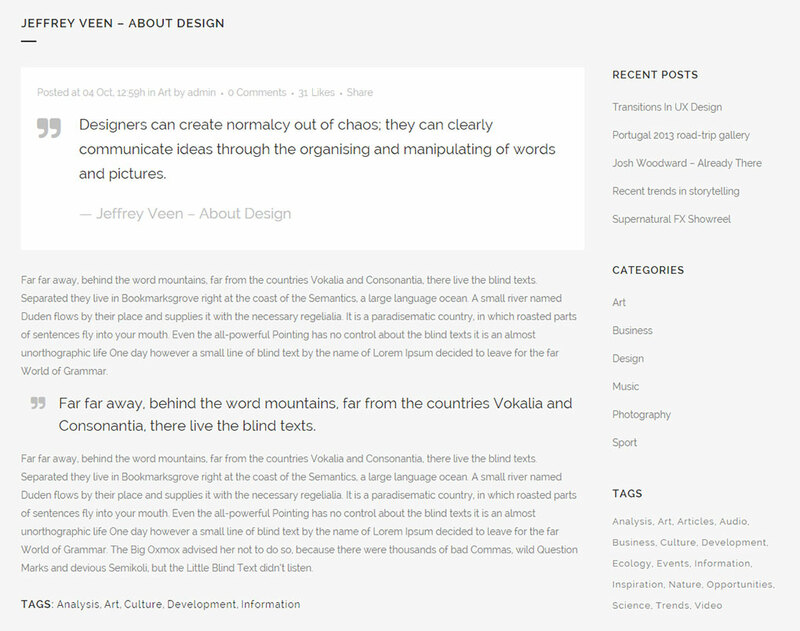 Show Category Names– Choose whether to display the category names on your blog slider. Category Name Color– Set a color for your category names. Show Date– Choose "Yes" if you would like the date to be displayed on your posts. The date will be displayed in the following format: M d, Y (e.g June 15, 2015).This option doesn’t affect the date when the Carousel type of Blog Slider is selected and Post Info Position is set to Bottom. Date Color– Set a color for the date. Title Tag– Set the heading tag for the post title. Title Color– Set the color for the post title. Comments Color- Set a color for the comments post info. 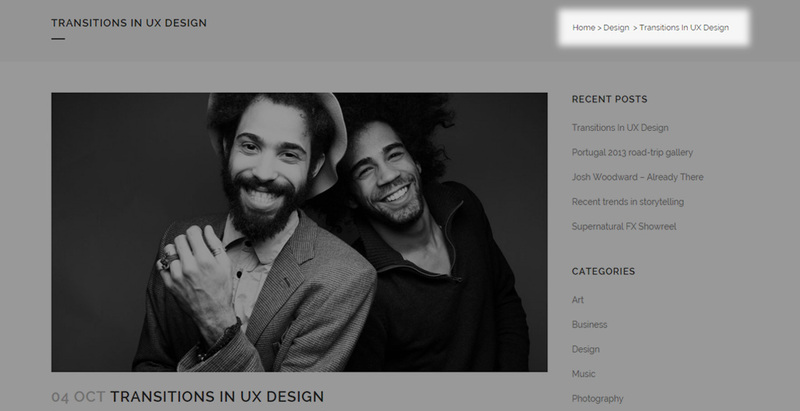 Prev/Next navigation– Select whether you would like the previous and next navigation arrows to be displayed. Extra class name– If you would like to style this particular blog slider differently, you can use this field to add an extra class name to it and then refer to that class name in your custom css. Show Author - Set this option to "Yes" if you would like to show the author’s name. Author Color - Set a color for the author's name. Show Excerpt - Set this option to "Yes" if you would like to display the post excerpt. Excerpt Length - Define the length of the post excerpt. Show Read More Button – Set this option to “Yes” if you would like to display a “Read More” button on the slider.